Offensive Battle Goes to Twins ~ The Bucky Channel - The World of Sports from Wisconsin's Perspective. Before Friday's Brewers/Twins game, there was a point I actually compared Seth McClung to what Yovani Gallardo was supposed to be. I compared a journeyman converted reliever into one of the best prospects the Brewers have had in years. I love Seth McClung as much as the next guy, but I was wrong on this one. Rough outing for Big Red yesterday, going just 4 2/3 innings, giving up 9 hits and 5 runs. It will take a lot more of these kinds of outings before his spot in the rotation is questioned, or before he's the odd man out if the Brewers make a deal, but I was getting used to McClung pitching like a No. 2 starter for a while there. 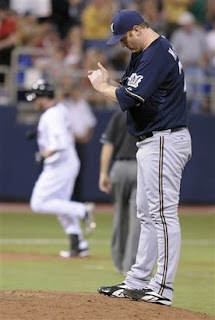 However, when he left the game, the Brewers actually had a 6-5 lead. The Brewers were again the benefactors of the long ball, getting shots from Hardy, Branyan, and two from Corey Hart. It wasn't enough to pull it out however, as a Joe Mauer home run off Guillermo Mota won the game for the Twins. Game Two tonight at 6pm.